Cruising to the Ang Thong National Park, approximately 3hrs, depending on the weather. Kayak exploration around the islands. For the nights on the boat, we sleep on mattresses or in hammocks, we also provide blankets and pillows. 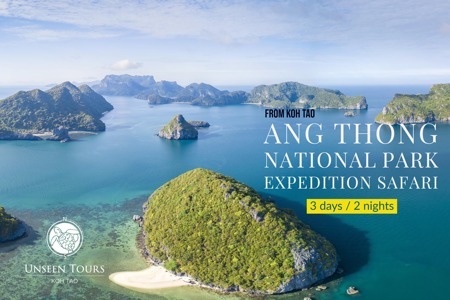 This is our best trip to Ang Thong National Marine Park in 3 days / 2 nights Expedition Safari. Beers ($) and Soft Drinks ($) are available for additional price. Would you like a private trip? click here. Cancellation: We will refund the entire deposit if we have to cancel the tour due to bad weather or less than 6 passengers. The minimum number of people for the trip is 6 passengers. This program is subject to change, depending on the weather or the big tour companies. we try as much as possible to avoid the tourist flow. We visit all the tourist attractions and much more in 3 days. Depending on the weather, we sometimes need to leave earlier in the morning to avoid the big waves on the way back to Koh Tao, we then spend the rest of the day snorkeling around Koh Tao. Please, select a date above for booking.